The Best Coffee Shop in Vienna ? A pretty bold statement to make, especially in a city that prides itself as containing a selection of the best coffee houses in Europe. Steeped in history, especially in coffee history, Vienna, Austria’s capital city has long been synonymous with coffee, BUT times have moved on. I may sound critical, but I must admit that when I first criticised the Viennese coffee culture way back in 2008, I got my letter published – WHY ? Because I felt and still feel that drinking coffee in the 21st Century should be about flavour, service and innovation and the editor of Conde Nast Traveller agreed. Moreover, having lived in Vienna for over 8 years until 2009, I never found any coffee shop, new or old serving properly brewed espresso. When I questioned them, they looked at me like what do you know – we are in Vienna and we know coffee – Well! No! you don’t if you don’t clean your group heads, extract 30ml of coffee in 10 seconds, etc. There were the odd exceptions like the Mocca Club (one of my first posts in 2007), but that shut down and the other was the local La Marzocco distributor (who confessed to me that Austria doesn’t know & appreciate espresso). So, on hearing that Vienna would be hosting the World Barista Championships (WBC) in June 2012, I was nervous for the city – where would all the coffee tourists go to sample finely crafted espresso drinks and third wave style coffee. Nevertheless, in late May 2012, I had to visit Vienna again and prior to my visit I contacted the Speciality Association of Europe (SCAE) for where to grab a really good coffee and they only had recommendation, Caffe Couture. Situated in the 9th District off Vienna, not far from the University and the Austrian MINT (where they make money), Caffe Couture, located on 9 Garnisongasse, can easily be missed, as there’s no signage annoucing its location. However, for coffee buffs like me, as I was walking by, I heard the sound of milk being frothed, looked into an auspicioulsy white decored shop and BANG, noticed a La Marzocco Strada (probably the most expensive espresso machine in the World and probably the most advanced) – OK! this must be it. Further along the left-hand side, I noticed more gadgetry, a brew bar, complete with an Uber boiler, Hario V60 station and an aeropress – I’ve arrived in a coffee shop in Vienna that’s taking coffee brewing to the 21st Century, Phew!. Owned by former Austria barista champion and current coffee tasting champion, Georg Branny, Caffe Couture is probably, for me, the best coffee shop in Vienna. 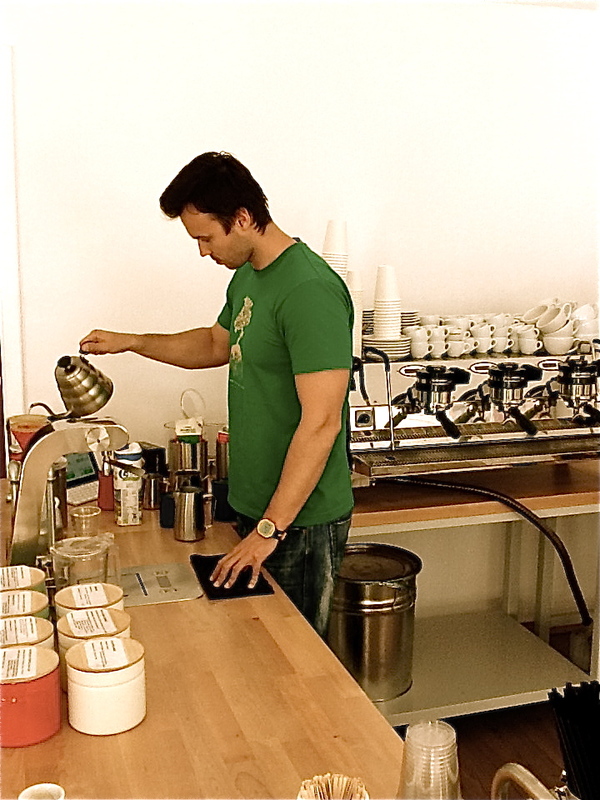 His attention to detail, pure focus on espresso brewing techniques, as well as his quest to offer Cup of Excellence Coffee, brewed on a proper brew station, Georg is so sure of himself and his quality that he doesn’t have a listed price for coffee – Yes! you read that right – there’s no published price for espresso coffee of any kind, so you can walk in there, order a cappuccino, and walk out without paying, but trust me, as soon as you taste what you have, you’ll turn right around and dig into your pockets – because the coffee you have just sipped is unlike any cup of coffee you’ll taste in Vienna, complete with exquisite latte art – his partner is also a latte art champion. 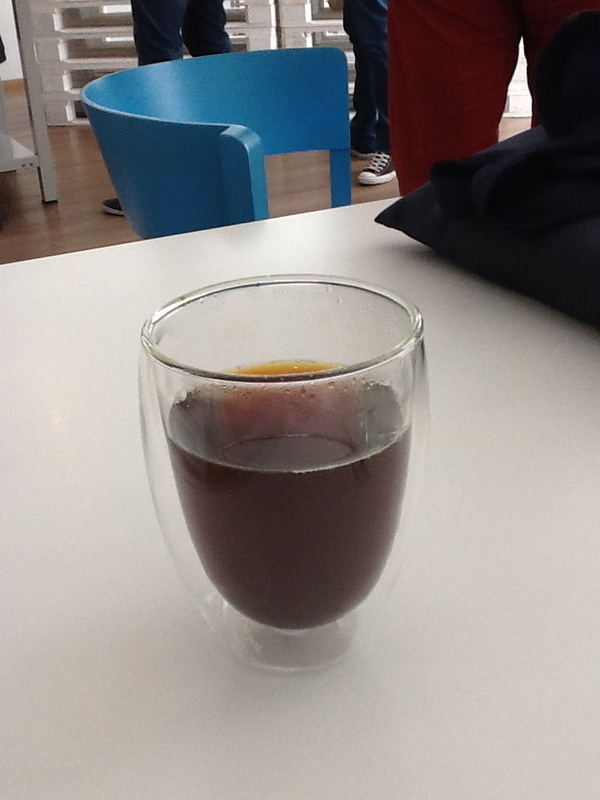 I was so excited, that I had an espresso macchiato and a V60 Cup of Excellence coffee – Finca La Picona from the Honduras/Nicaraguan border, prepared on the brew bar using the V60, served in a classy Bodum double-walled clear glass cup. The next day, I took my mum for a cappuccino. With regards to taste profile, the coffee has been carefully selected to highlight cocoa notes when mixed with milk and hints of berries/cocoa when drank as a pure espresso. Georg, a pleasant and unassuming character with a friendly and warm smile, is trying to get the Viennese into the third wave culture of coffee by sourcing Cup of Excellence coffees from his bespoke coffee roaster, with the hope that more and more people will begin to order them, so I wish him luck and I’m very happy that Vienna has a place like this to treasure. Needless to say, I was very happy to learn that the WBC after party was held at Caffe Couture – where else? 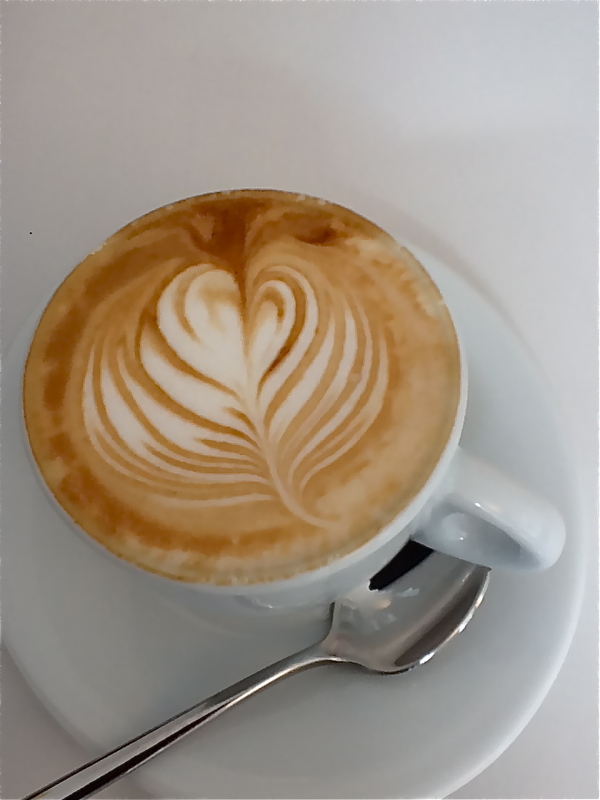 and that Caffe Couture have just started coffee classes – now all the good stuff happens, just when I leave…. So, when in Wien (German spelling for Vienna), please, please visit Caffe Couture, if you like your espresso drinks to be prepared well. This entry was posted on Friday, July 6th, 2012 at 9:37 pm	and tagged with Caffe Couture, Georg Branny, Hario V60, La Marzocco Strada, Uberboiler, Vienna Coffee Shop and posted in Bean There - Cafes, Coffee News. You can follow any responses to this entry through the RSS 2.0 feed.